First Calf for our homestead! I looked out my window this morning for my usual cow check (you know- to make sure they’re in the fence, not out of it, and for any extras) and I saw extra little legs! So I hurried to throw on some warmer clothes and ran outside to see! 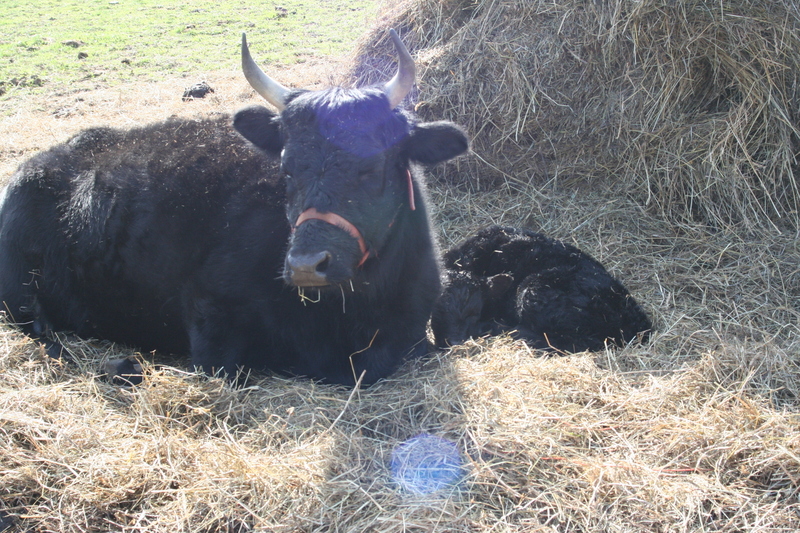 Norma had a little heifer calf. She was VERY new- I should’ve gotten up half an hour earlier! She was up on very wobbly legs and still pretty damp- and shivering. What a cold welcome to this new world! At least the sun was coming up. She did frisk just a bit on those baby legs. Then she went to lay down in the hay, and I put a fleece vest on her and fluffed up a nest around her. 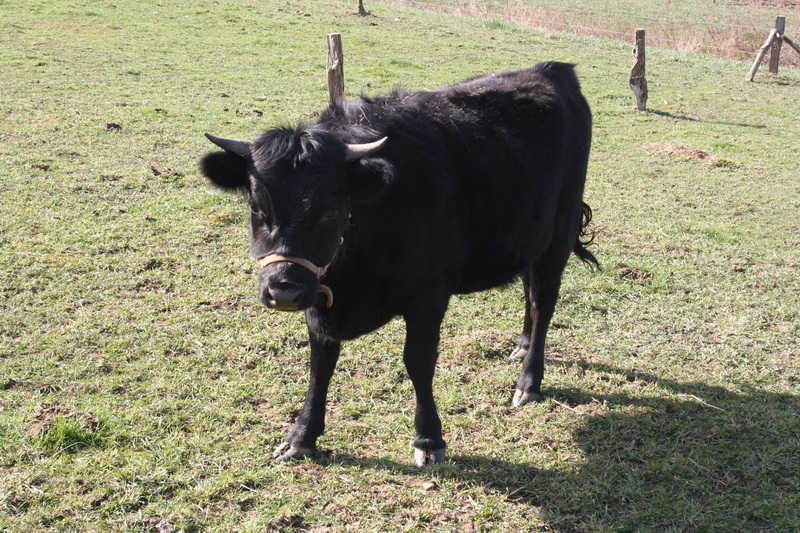 She napped for a while, and I gave Norma some water and beet pulp with molasses. Now that things are settling down a bit (and she isn’t shivering anymore) I took the time to get my camera. She’s a dexter lowline cross. Her half sister was born exactly 3 weeks ago- her momma, Eleanor (“Lannie”) went to live at the neighbor’s last fall. I was hoping for a bull calf since this is supposed to be our beef in 2 years. 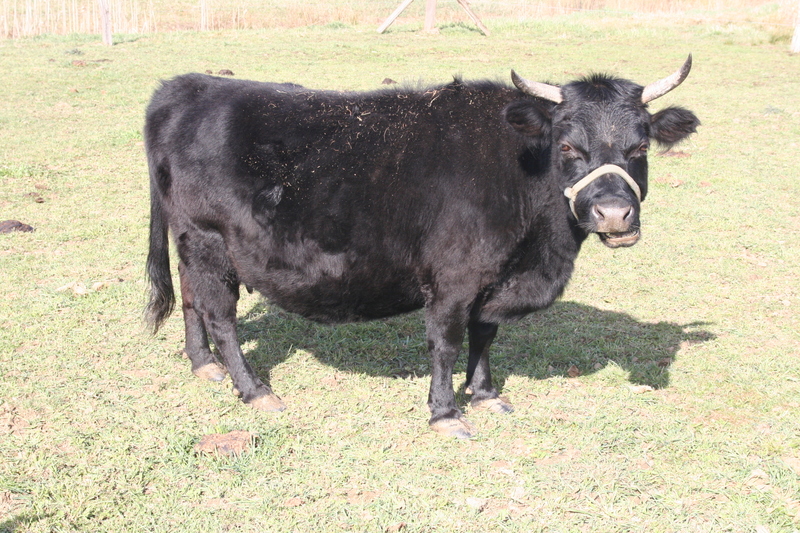 I’m also planning to get a dexter bull (for breeding and next year’s beef) in the next couple weeks, and would prefer to NOT have a young heifer around next spring, but we’ll deal with it when we get there. Now to search for a name! We’ve got life cycle lessons going on at the homestead. 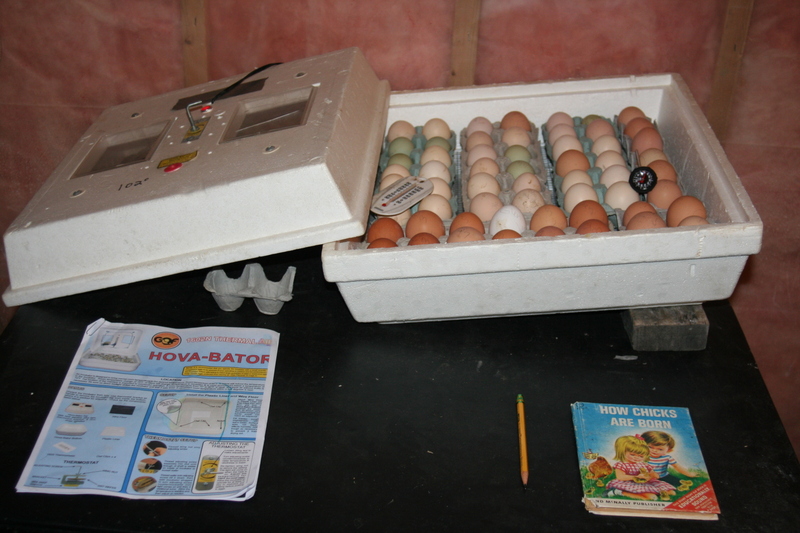 I’ve been collecting eggs and put them in a borrowed incubator on Sunday the 11th. I put a total of 5 dozen plus one in the incubator. It’s a Hova-bator- the simple still air version with no automatic egg turner. It’s my first time using an incubator and I’m experimenting a bit with the whole thing. 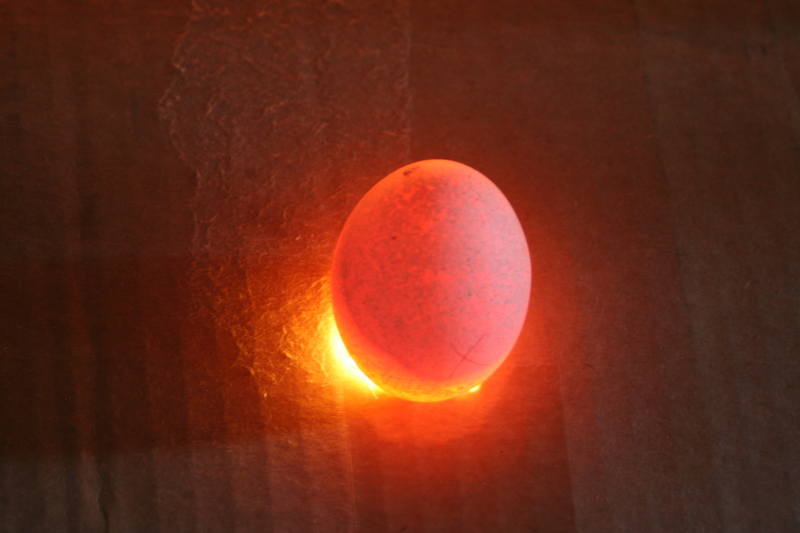 I’ve decided to try the egg carton method and I’m rotating the eggs by raising the incubator itself on one end, switching which end 3 times a day. That way I don’t have to turn 61 eggs 3 times a day. The 3 banty eggs on the top are the only ones I have to turn each time. Some more experiments: Due to my egg eaters (another post for another time) and maybe the cooler weather still, I struggled to gather many eggs in a 10 day timeframe. I wanted to fill the incubator and make it worth the electric and time. I bought a dozen fertile eggs from my uncle and got 9 more from the lady I borrowed the incubator from. 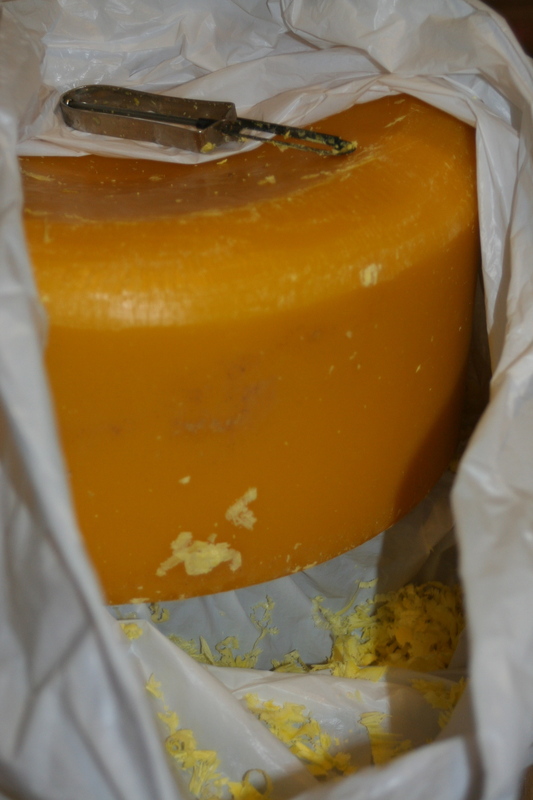 I also threw in a dozen+ that had been stored in the fridge, points up, unrotated, for more than 10 days… All no-no’s according to conventional incubating wisdom, although some people say it can be done. I THINK that several of those are developing. 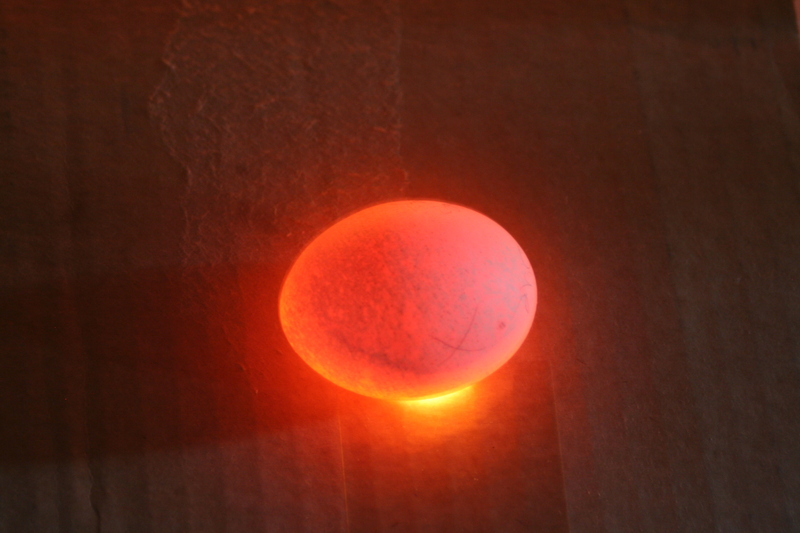 I took the first egg out of the incubator today. I’ve candled it a few times. There’s been a ring that rotates around, moving with the egg as I turn it, and I could see little else indicating development. There’s several others I’m watching, but I took the plunge and removed one today. To my relief (and contrary to my dreams last night- full of oozing, stinking,exploding eggs in the incubator) it didn’t stink yet. Today is day 9 of 21. 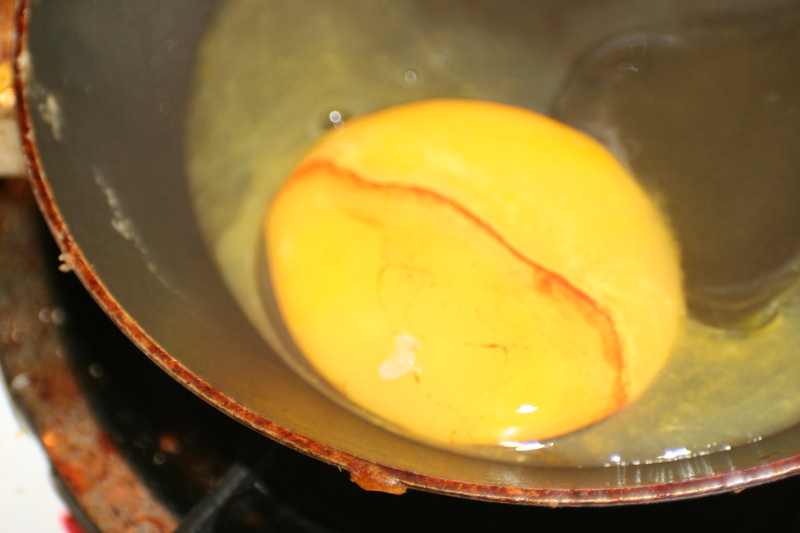 There was a tiny chick embryo (see the small whitish spot on the bottom of the yolk in the picture above), but this egg is clearly a “quitter.” The embryo should be much bigger by now and there should be vessels and such. 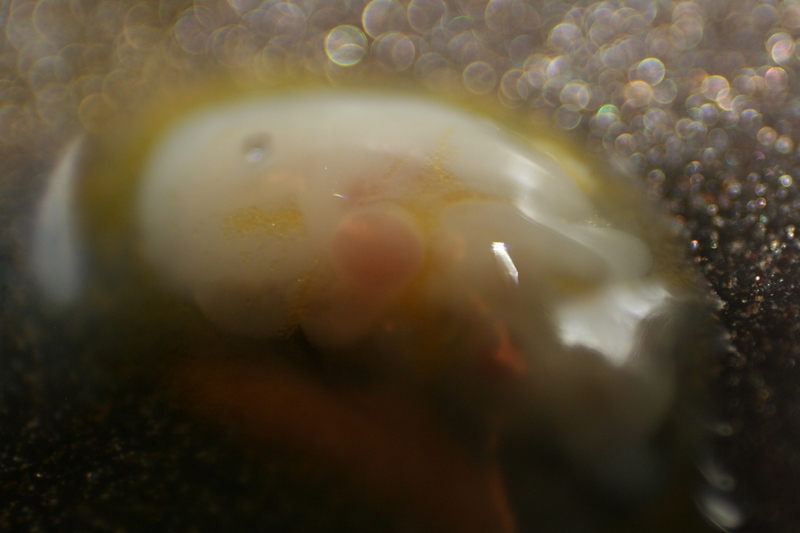 Hard to see, but I’ll throw in the “closeup” pic of the embryo as well. You can see a dot that is the eye and the buds for the wings. That’s all I know to identify. I’ll try to post pics of more of the progress as time goes on. My candler (lamp in a box with a hole; 60 watt fluorescent bulb) isn’t that great- I need to find a better way (aka a good strong little flashlight). My mom came over and helped me “cull” my extra Chantecler rooster that I’d kept over the winter. He was just under a year old. I would have had a harder time deciding between the 3, except this one volunteered for the stew pot. He started to rush me and act like he was going to attack- never quite attacked, but I didn’t like having to watch my back every time I stepped into the chicken run- especially since I was doing it so often to collect eggs for incubating. It’s been many years since my mom had chickens to dispatch- and I’m not sure if she ever had to do some of the parts we had to that day. And my only experience was helping when I took my extra roos to the amish last fall (I wrote about it here). 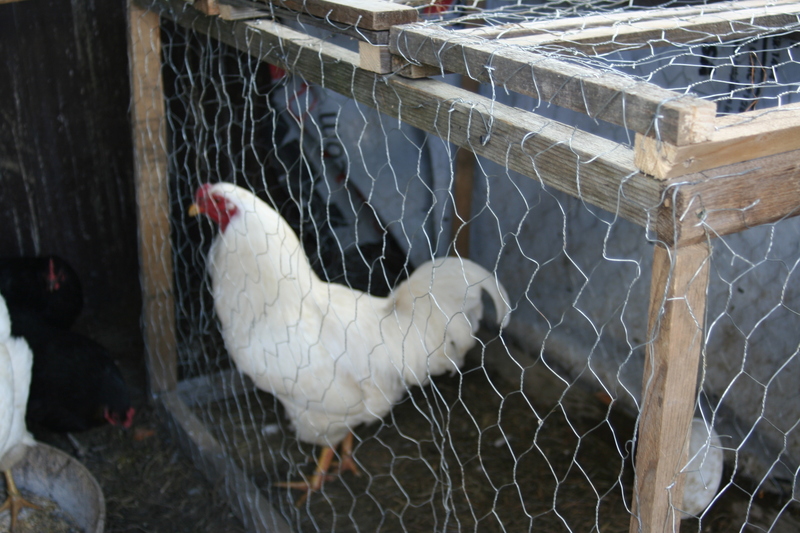 I made a “cone” out of aluminum coil stock- and found it needs to be adjusted to allow the body of the chicken into the cone further for next time. Either way, we got it done and I soaked him in ice water. I neglected to weigh anything- I really need to get a small scale. 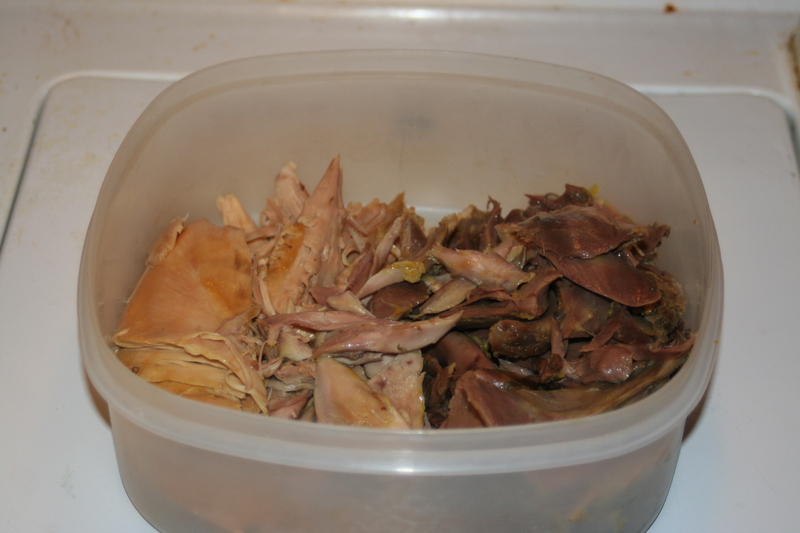 Then stuck him in the crockpot all day on low as in the recipe I found here at Wilke Farms. This is the meat I picked off. VERY dark meat- I was surprised at HOW dark it was. I made stock out of what was left of the carcass and some veggies. I tried the crockpot method, kind of like I saw here at Nourishing Days. I’m not real excited about my stock attempts yet. 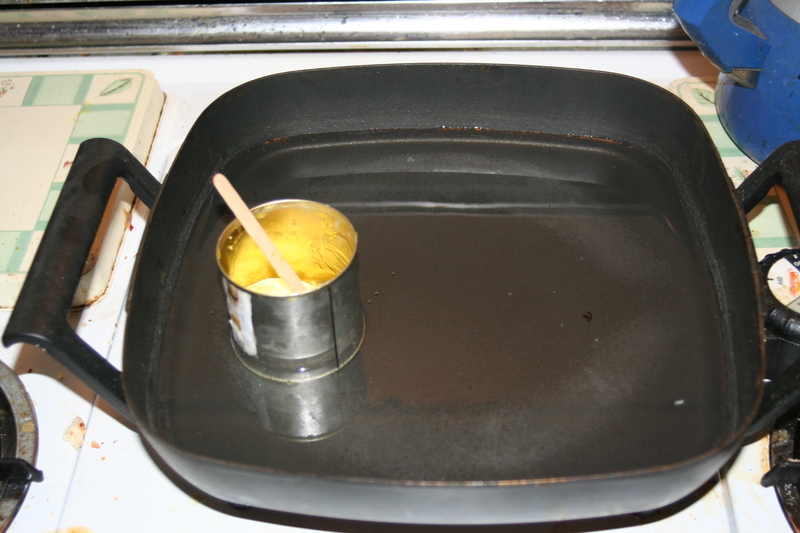 I’m going to try the method from my “American Classics” cookbook next time. I’d love to have some flavorful, chicken-y stock. 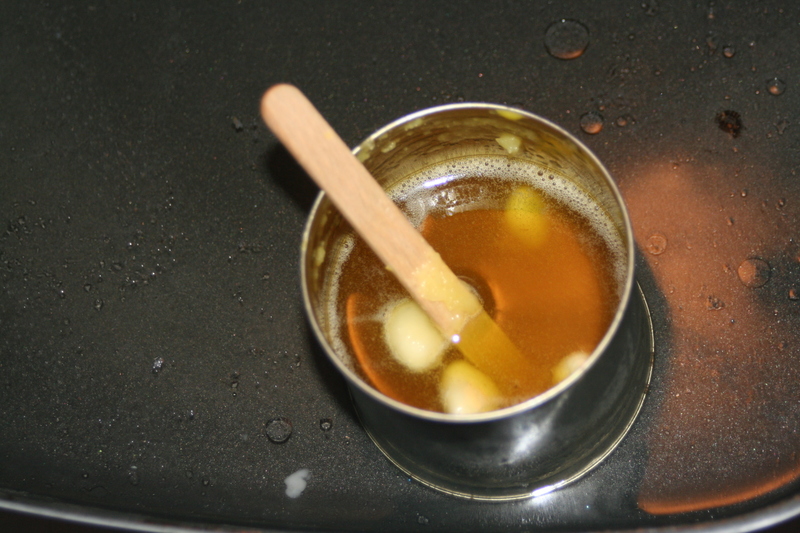 I’m disappointed that I have to add chicken bullion to my chicken stock. There’s just something wrong with that to me. We had my parents over and enjoyed some “mean chicken and biscuits” for Sunday lunch. 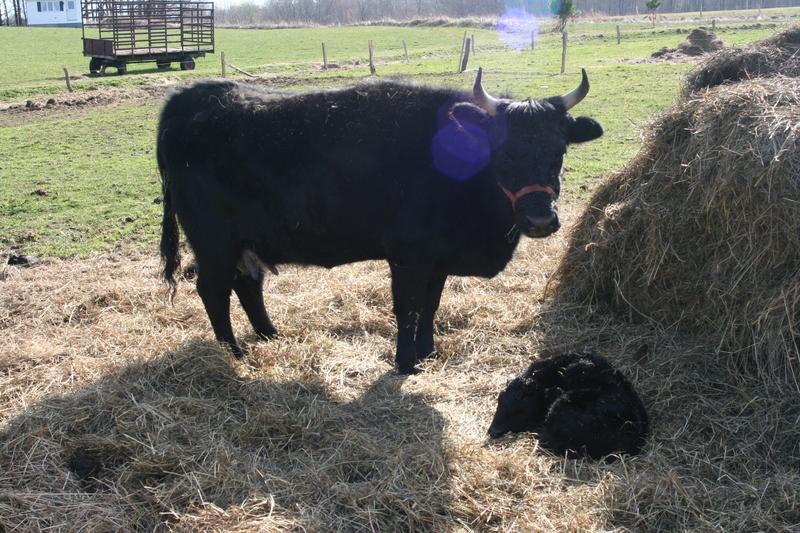 Another lifecycle lesson to come- Norma the dexter cow should be calving within the next 2 weeks! her “due date” is March 28. 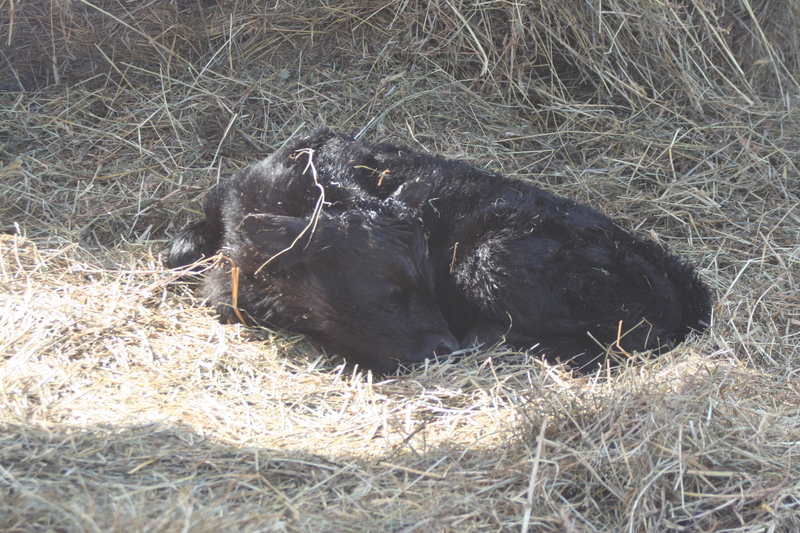 Lannie, now the neighbors, had a heifer calf on the 9th (due date was the 7th). 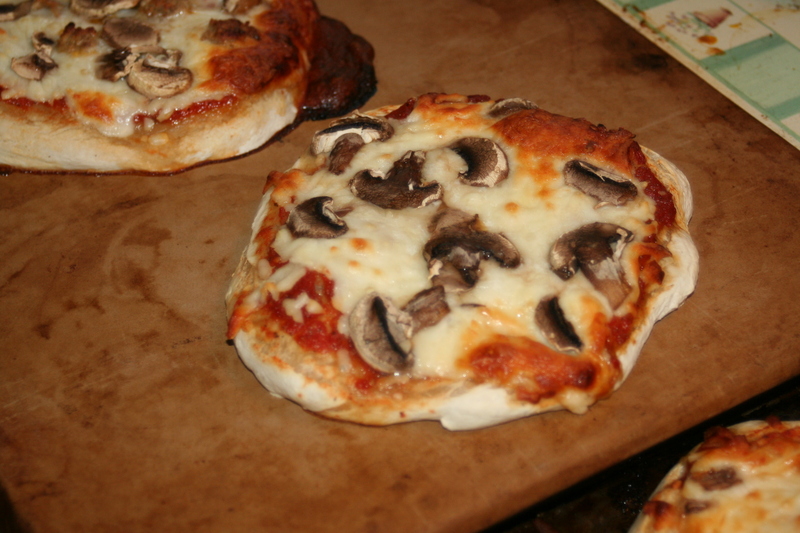 I think one of the top convenience foods for the freezer is ready-made pizza. It’s an always welcome food at our house, and so easy when it can just be popped in the oven. Unfortunately, I hate to buy them and much prefer the taste of homemade- I think the store-bought ones just keep getting worse! While this homemade version isn’t quite as quick as the boughten, it’s pretty close. Plus it’s so much better tasting! When I make homemade pizza, I’m now doubling or tripling the dough just so I can keep these on hand. It’s the latest “go-to” meal at our house. dried basil, oregano, onion, garlic, parsley, etc. 1/4-1 t each. 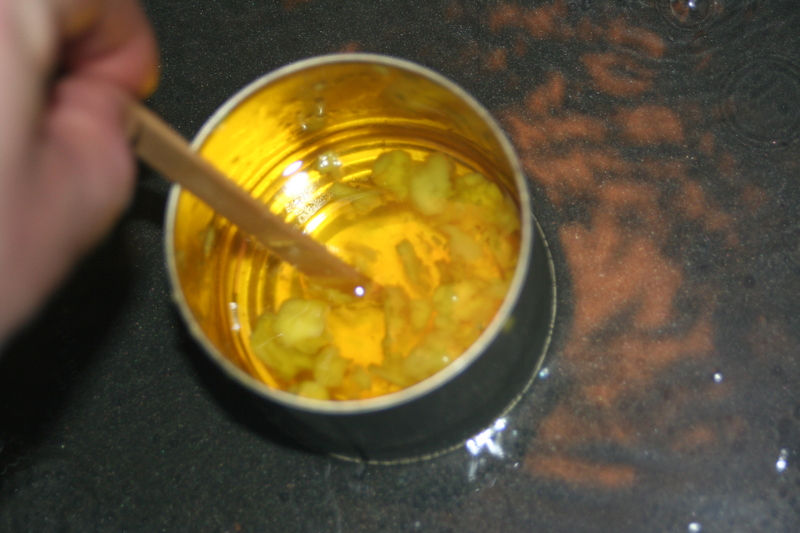 Can also use part of a spaghetti sauce seasoning packet. 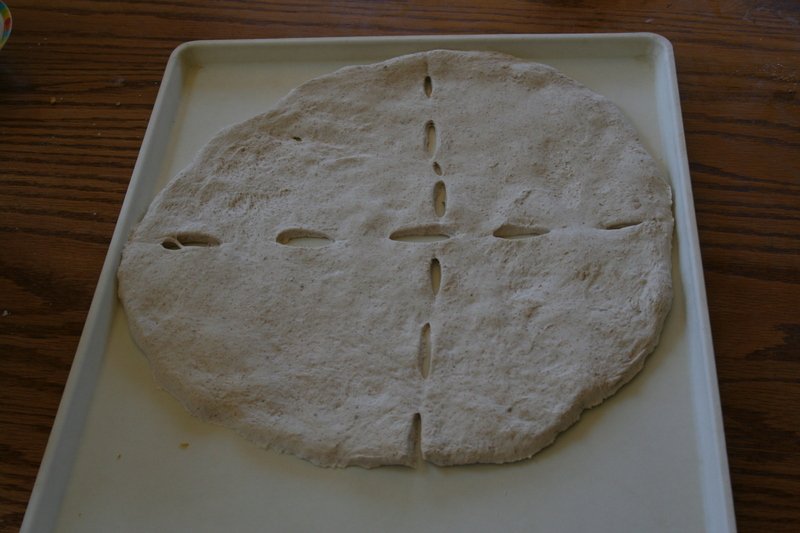 Disolve yeast in warm water, add 4c flour and all other ingredients, beat smooth, add remaining flour to make a soft dough. Knead ’til smooth and elastic. Place in greased bowl, cover and rise 1 hr. 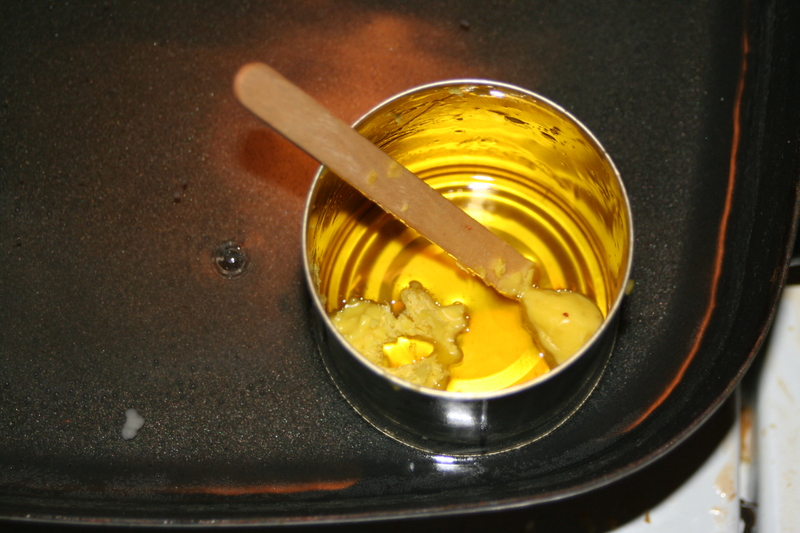 punch down, divide onto pans and spread. Top as desired. Bake 15-25 minutes at 400-450. To make pizzas for the freezer, spread the dough into circles and flash freeze on a tray in the freezer. 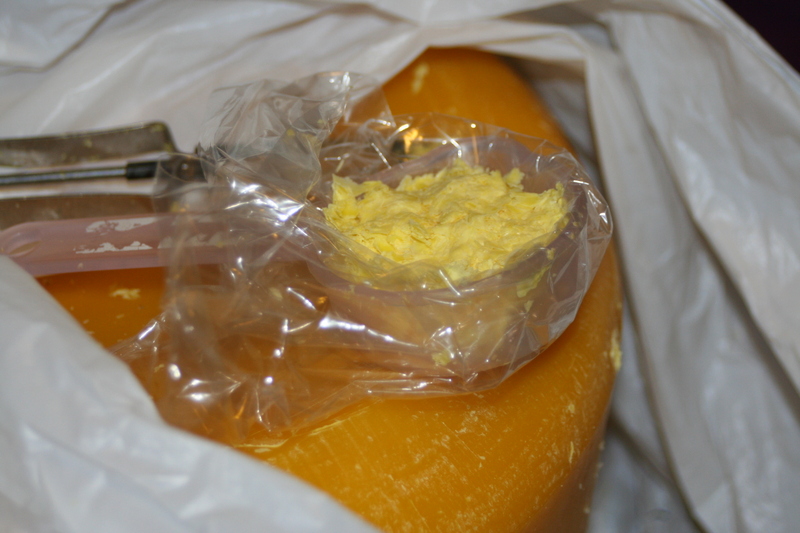 Then pop them in a gallon size ziplock bag for storage. 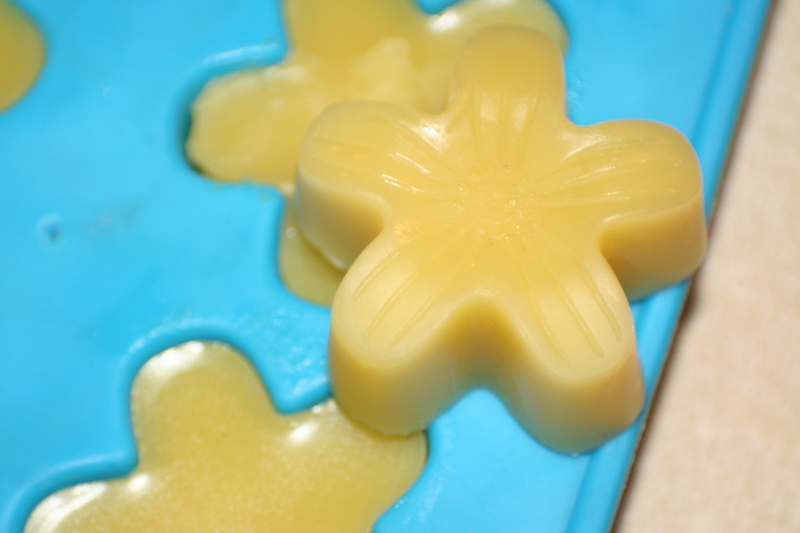 They can be made various sizes- whatever you choose- so long as it still fits in your bag. 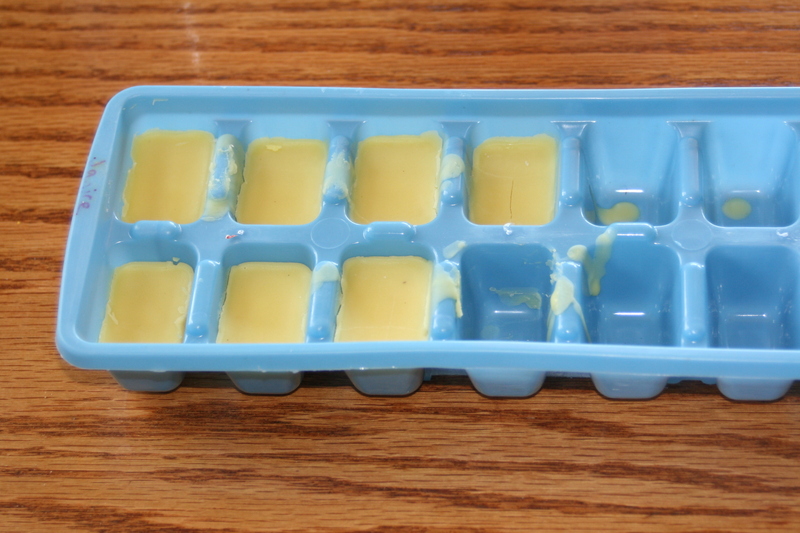 To use: Pull out of the freezer, top with your choice of sauce and toppings, and pop it in the oven. No need to thaw it before using- they bake up just fine from frozen in the oven. 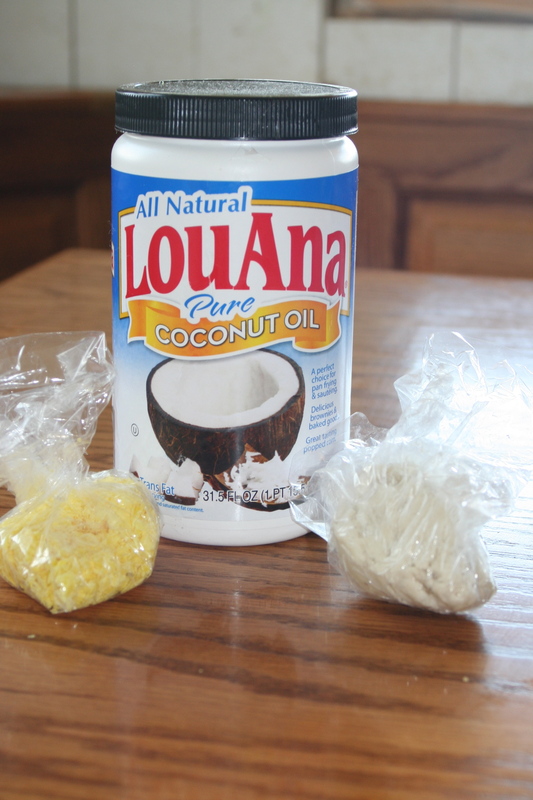 It works on a baking sheet or on a stone. 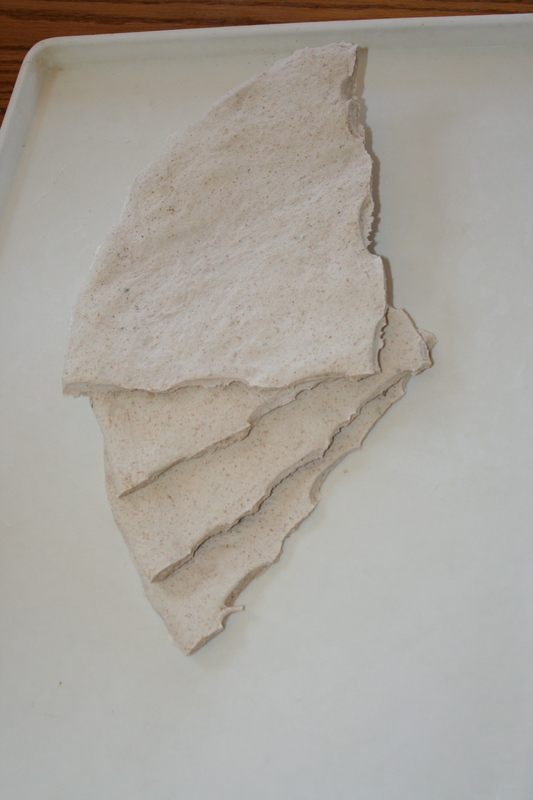 If you like to use a pizza stone, preheat your stone before you take out your dough. 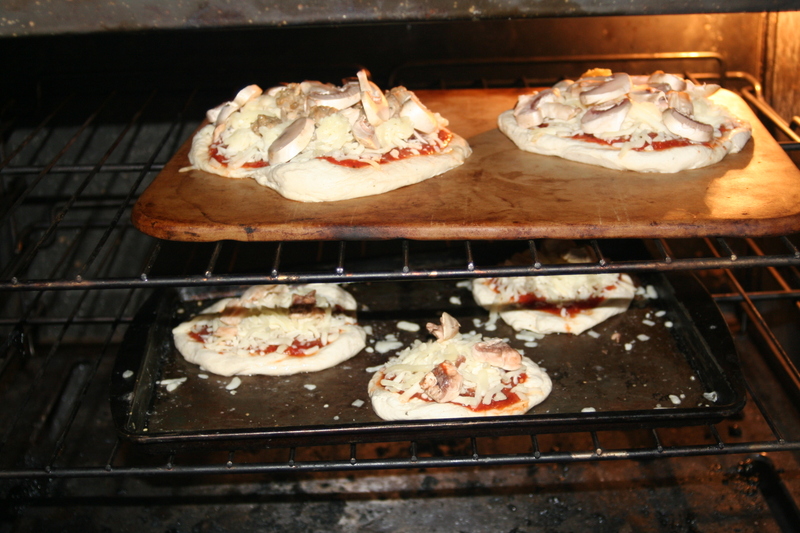 Then add toppings, and you can pick up the whole mini pizza (since the dough stays stiff when frozen) and set it on your stone to bake. It may take a bit longer than your usual homemade pizza to bake, but you didn’t have to make the dough and wait for it to rise. Bake time is more like 20-35 minutes, depending on how “done” you like it. Note: I haven’t tried topping them when I flash freeze them, but it’s reasonable to say they’d probably do just fine if you want pizza that’s completely ready to throw in the oven. Just maybe a bit messier to store and a bit longer to finish baking? ETA: I made some the other day. 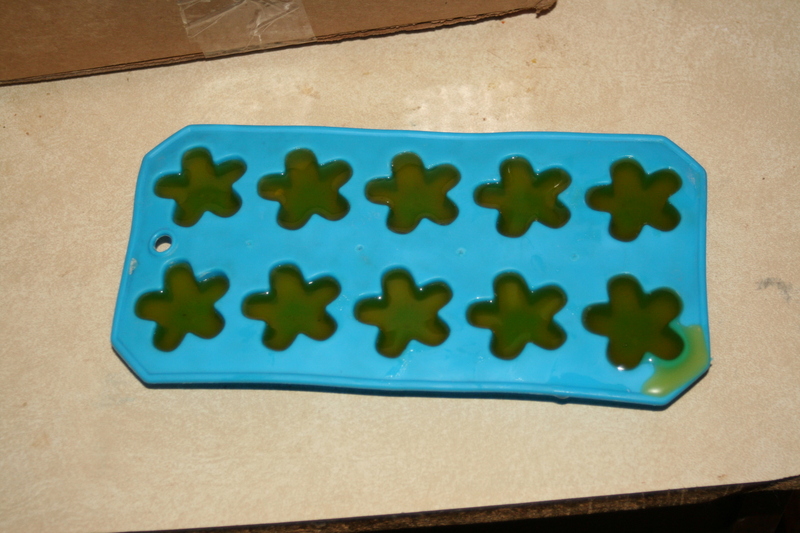 Here’s pics of them going in the oven and coming out. Yum! Another edit. I made some full size and scored them before flash freezing, then broke into chunks for longer term storage in ziplocks. To use, just put those puzzle pieces back together for a full size pizza. If you’re baking on a stone, move quickly to get the topped pieces onto the preheated stone before they thaw too much… or let them completely thaw and rise a bit before baking. We’ve found that if you start the frozen dough on a cold stone the crust isn’t very good. And don’t do big scores, do smaller ones so you don’t have as big of gaps to contend with- I have since modified my technique again. 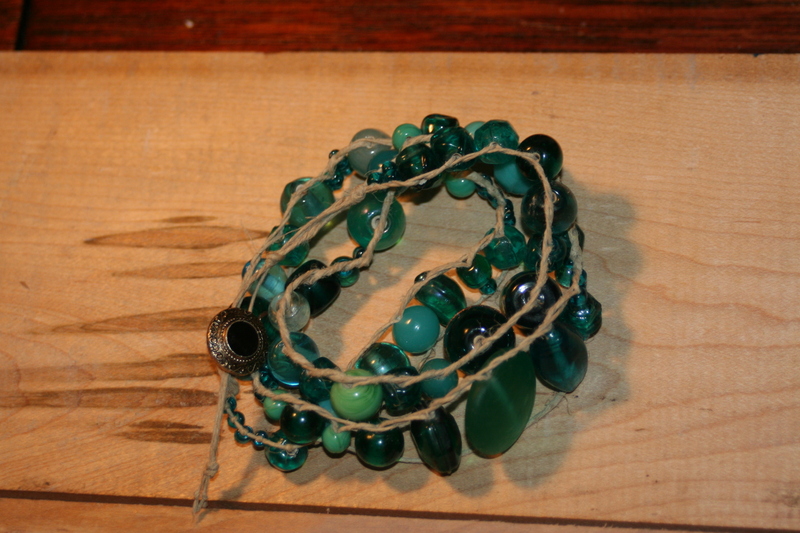 I saw a neat bracelet on pinterest that I wanted to try. 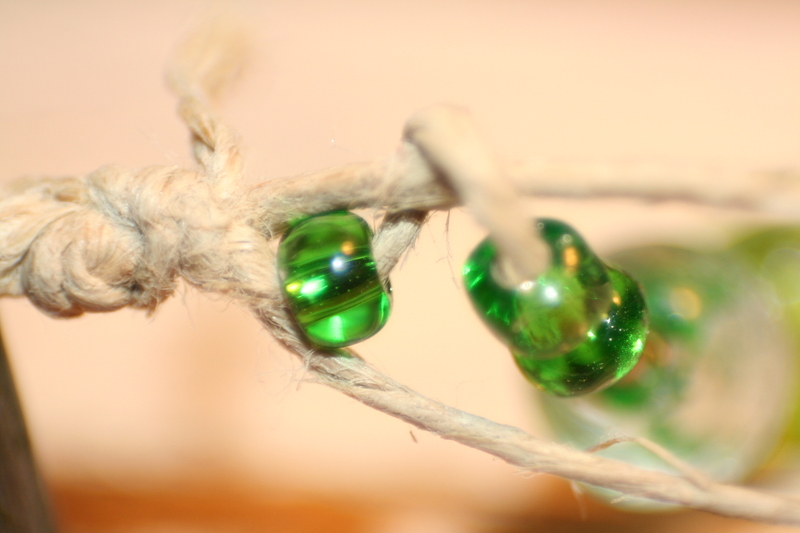 It can be found over here at Lima Beads. I used materials I had on hand, and this is how mine turned out. The only problem is that I wanted to make these for gifts, and 3 hours to finish one wasn’t going to fit the bill. 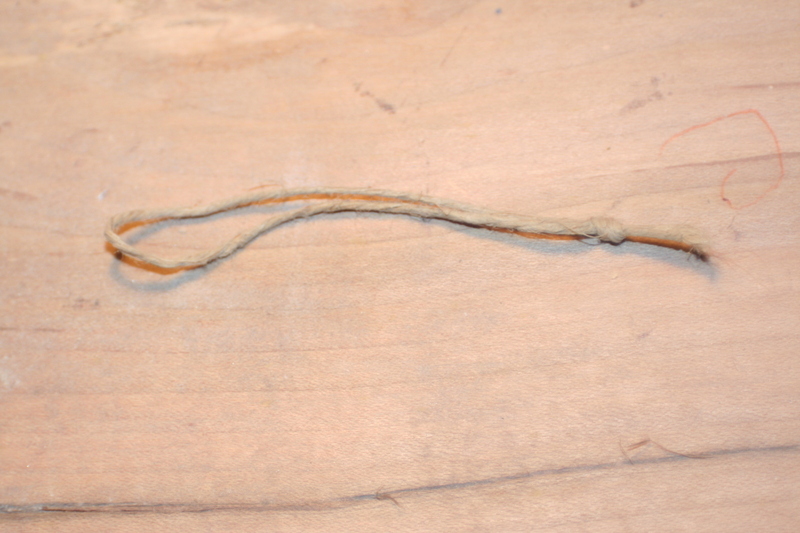 Here’s the basic idea of how I did the ladder stitch with hemp, in case you want to try it that way. There are 3 strands- a top and bottom that are the sides of the ladder, and the bead strand that forms the rungs of the ladder. 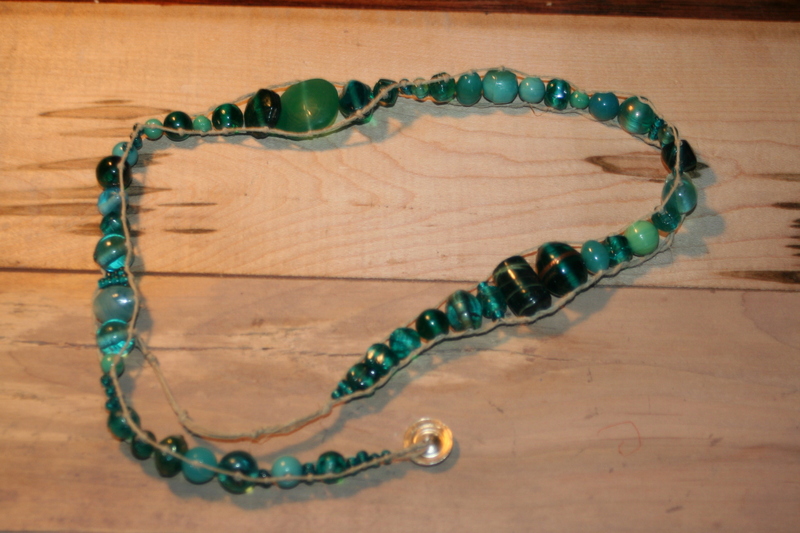 The bead strand must go through the bead hole twice- I found it easiest to push a loop through the bead and put the top strand through the loop, then wrap around the bottom strand and repeat with the next bead. I developed the following method that cut down the time to make one to more like one hour- much more do-able for gifts, or to make myself a few more. It looks very similar and moves along a lot quicker (at least it did for me!) 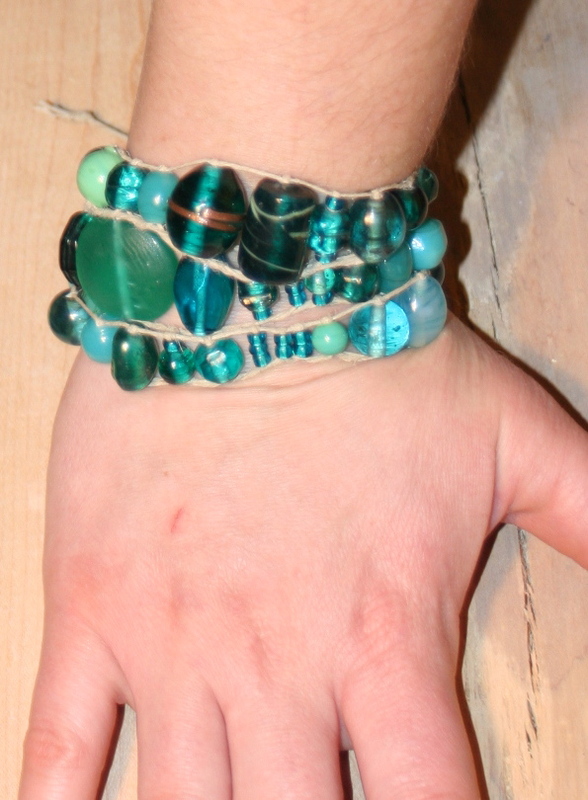 These are pretty heavy with all those glass beads, but I definitely like them. 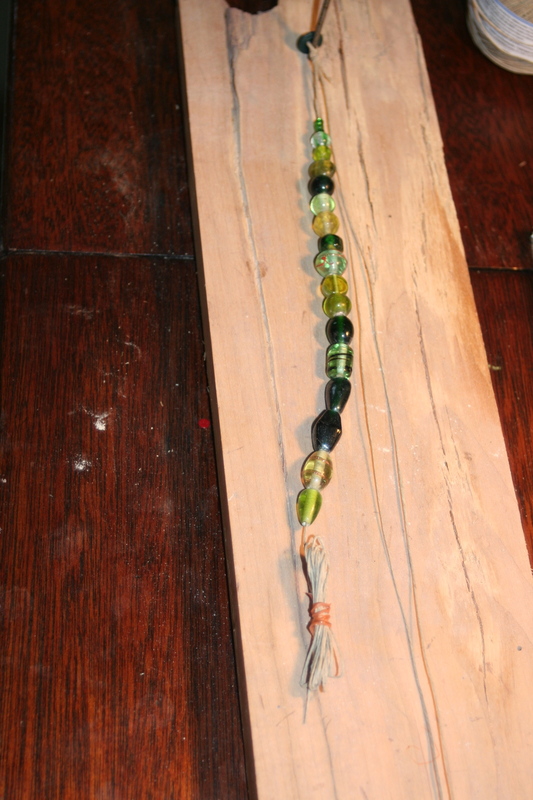 You’ll need: a button (shank, 2 hole, or 4 hole- any will do), around 50 beads-various sizes, several yards of thin hemp cord (or other string material of your choice- I also tried one with waxed linen, but didn’t like the way it turned out as well), a scrap of wood about 2 feet long, and 3 nails. The “loom” acts as another set of hands and speeds up the process. 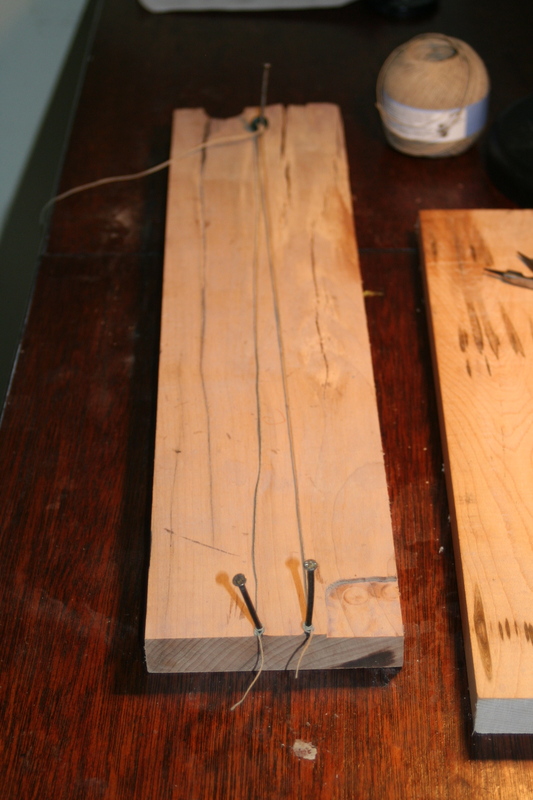 To make your “loom,” pound 2 nails about 1 inch apart on one end of the loom. 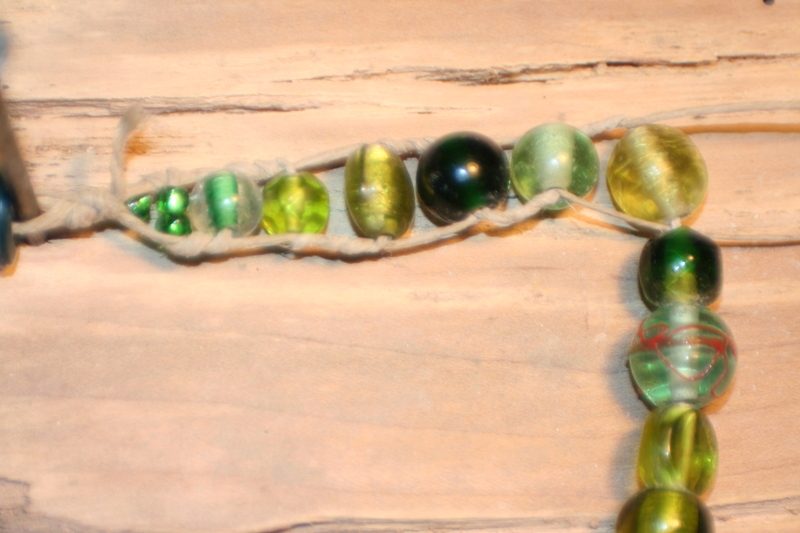 The nail placement for the other end depends on the length of your cord/bracelet. To determine the length of your cord: wrap it 4 1/2 times around your wrist, then fold the cord in half to double that length. 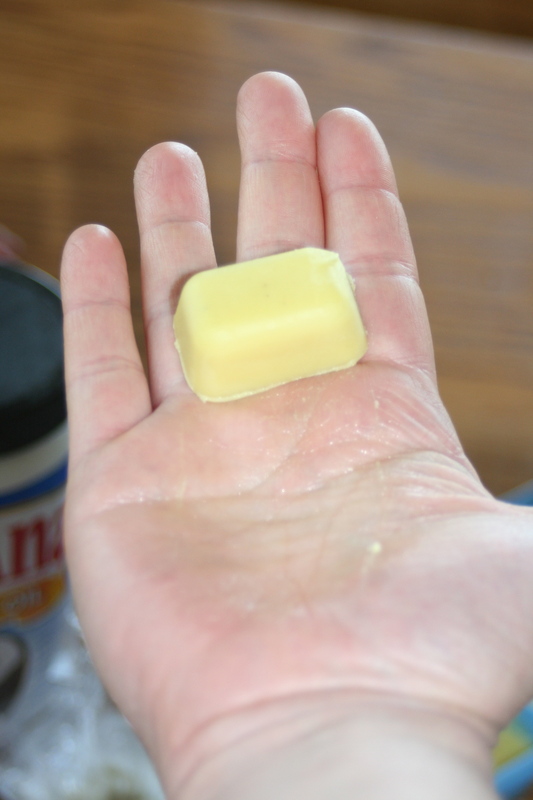 Cut. Cut a second piece of cord that is 3 times that wrapped length. 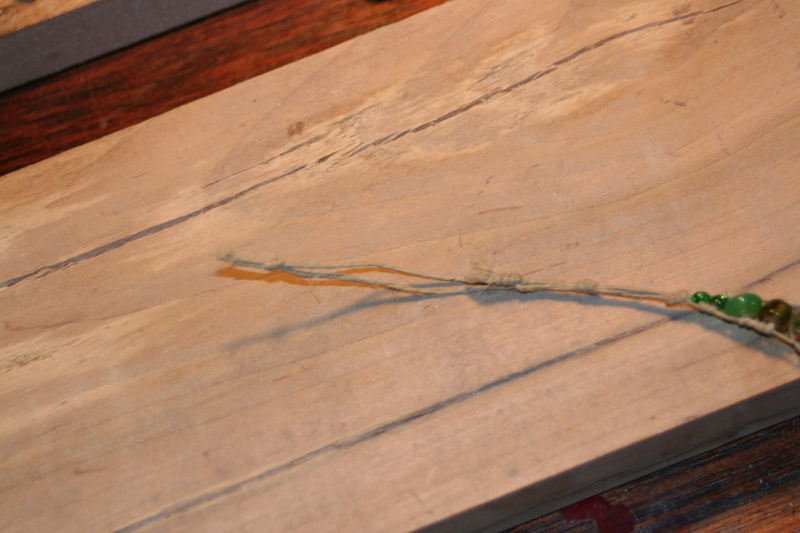 (For example, if my 4 1/2 times wrapped cord measures 25″, then my first piece of cord should measure 50″ long and the second piece should measure 75″ long.) Add a bit of length if you’re unsure. 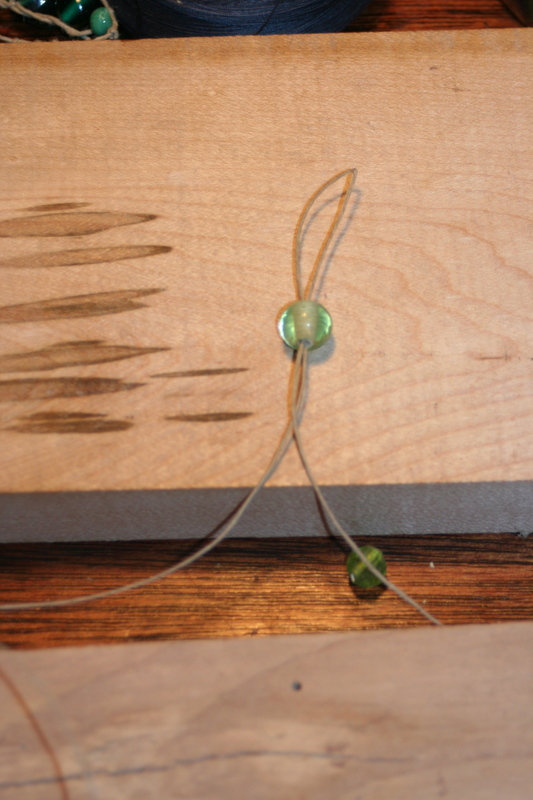 Take the first piece of cord and thread it through the button holes. The button will sit at the half way point of this cord. 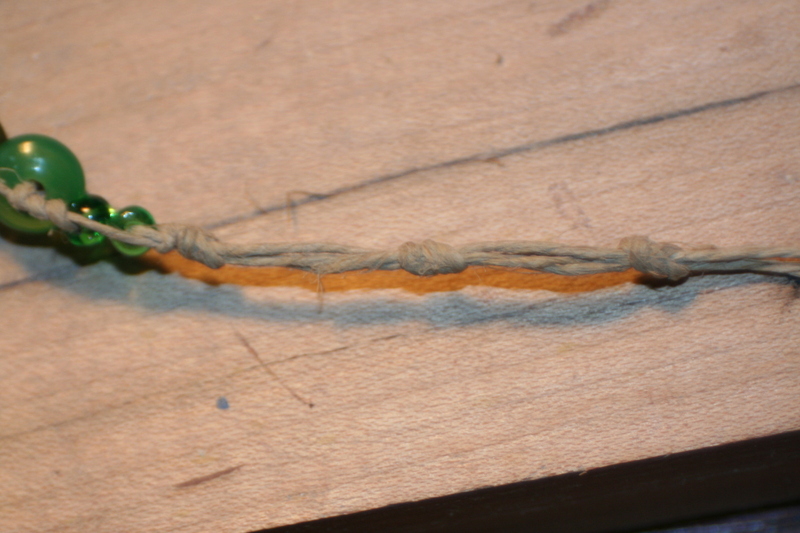 Line up the two ends, then tie the cord together about 1/2″ below the button with a simple overhand knot. The second cord will thread through the button holes as well. This cord only has a short tail that comes back to the working side from the button- Just enough to tie another overhand knot- but this time it goes around the first cord. It will be VERY long at this point. That’s okay. Put your cords on the loom. The space between the button and the knot goes over the single nail. 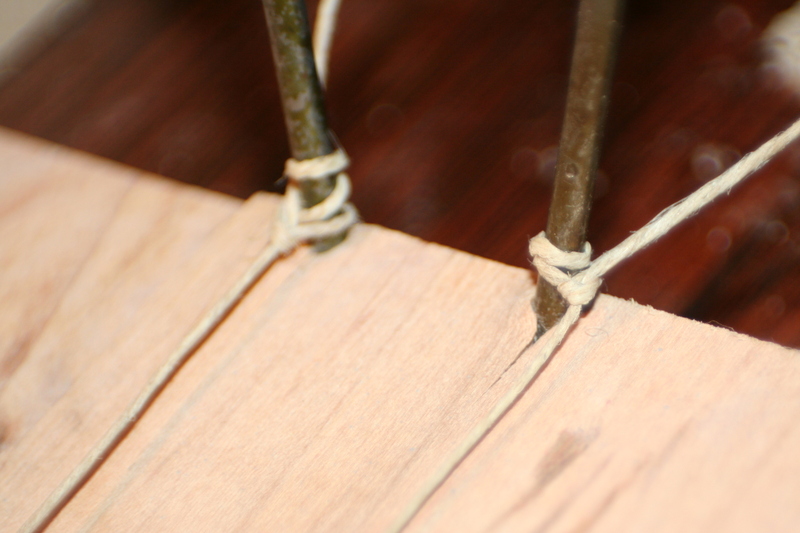 The two short strands tie off to the two nails on the other end of the loom. 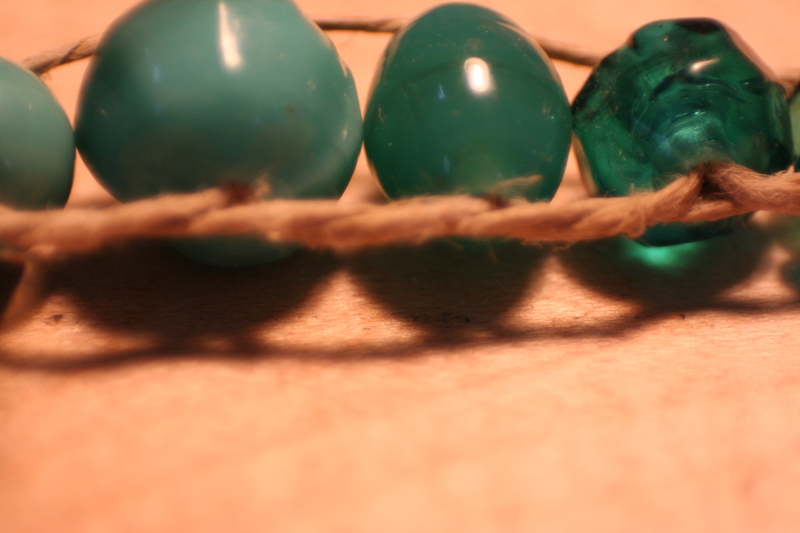 The long third strand stays free. 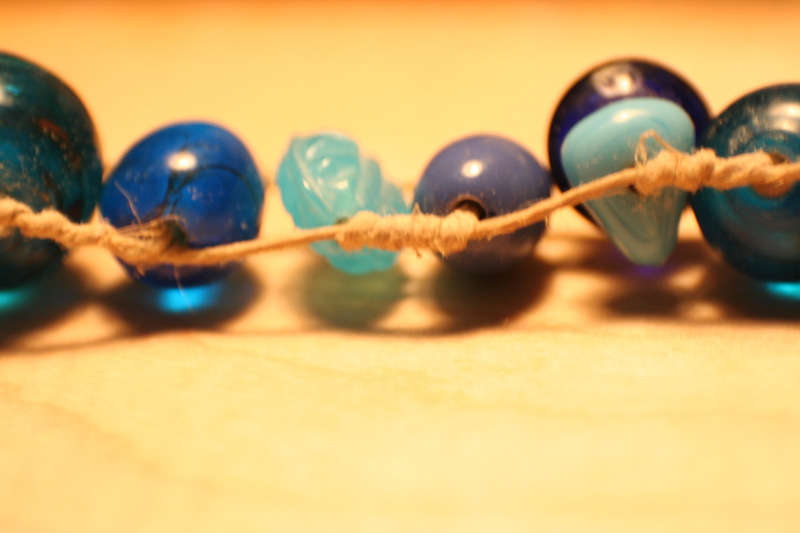 Start threading your beads onto the long cord. 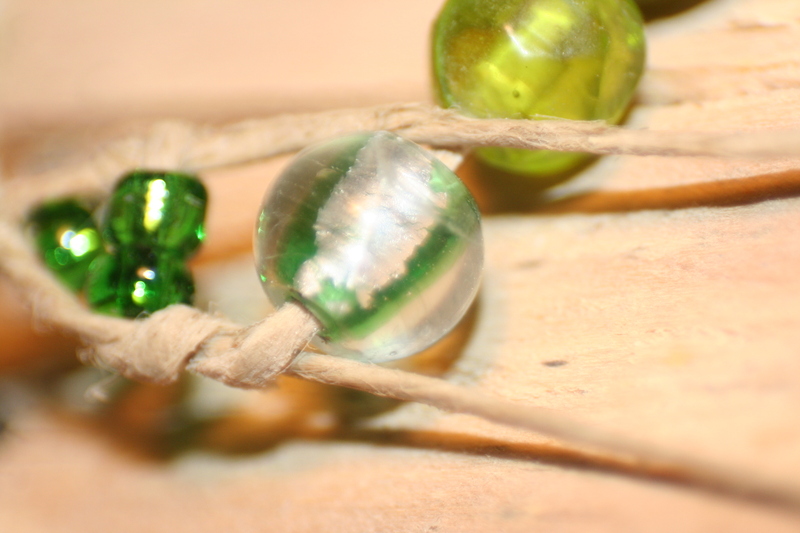 Begin with small (short) beads to gauge up from the knot. 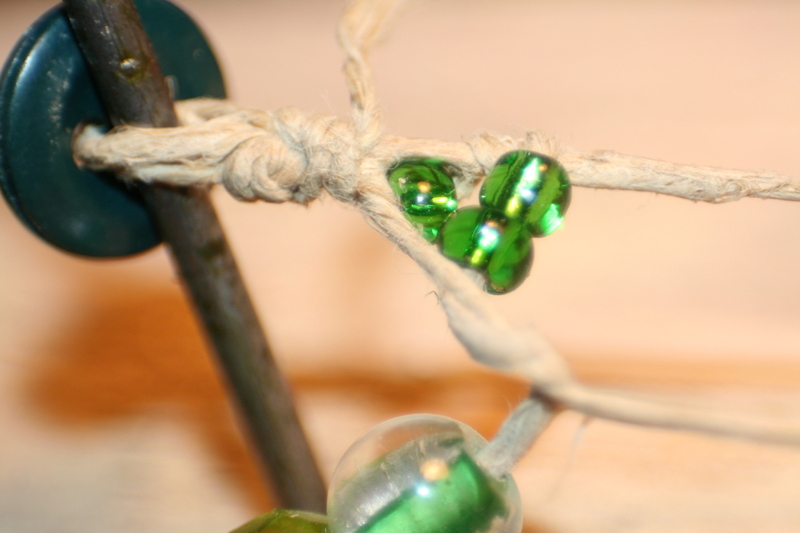 Continue threading bead on the strand. 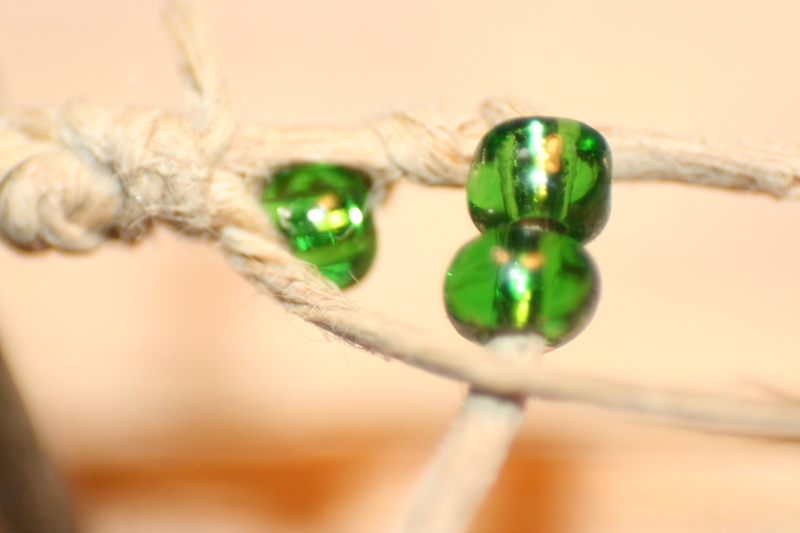 Be aware of how tall the beads are in comparison to the two next to it- you can accommodate a variety of sizes, but it works best to gradually increase or decrease. A couple of shorter ones can go next to a tall one. I do 15-20 at a time. Do however many you’re comfortable manipulating for each sequence. Secure the extra tail with a twist tie. 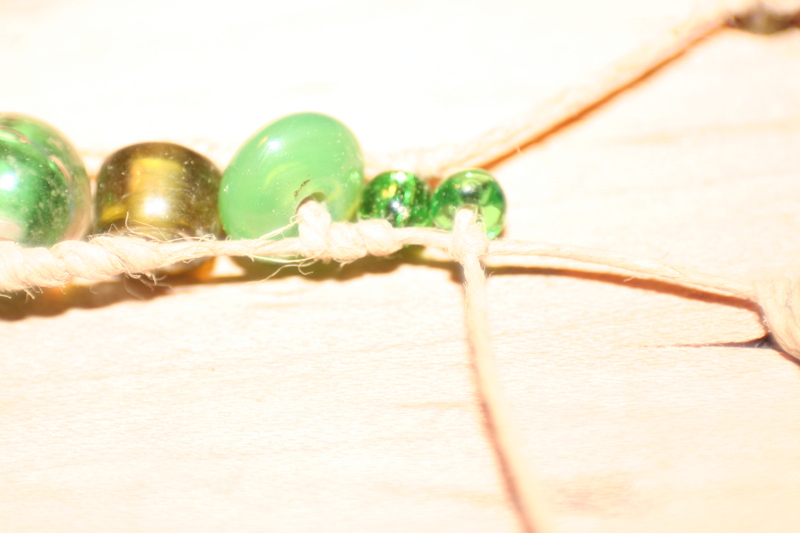 Leave a bit of extra space between the last bead and the extra tail, as you will use up length from the cord as you wrap/weave. 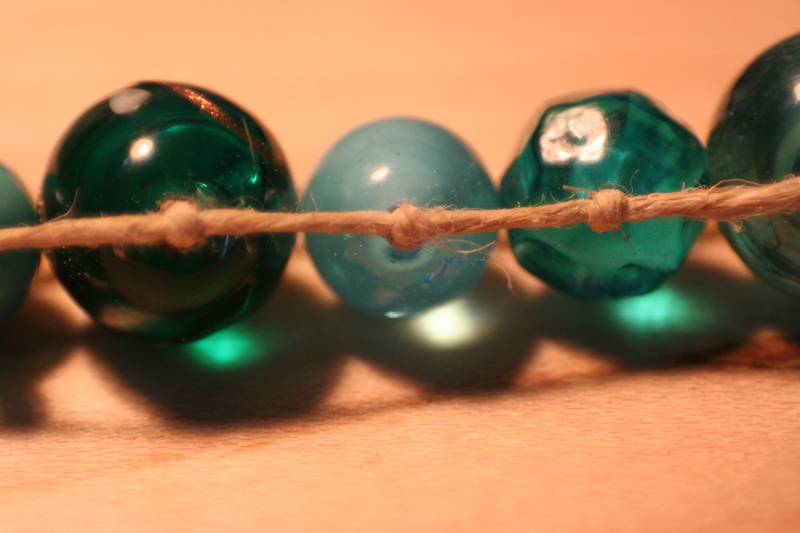 I like to add a small knot in at the end of a bead sequence before refilling my bead string, but it’s not necessary. Wrap, weave, refill, repeat until you get close to the end of your loom. 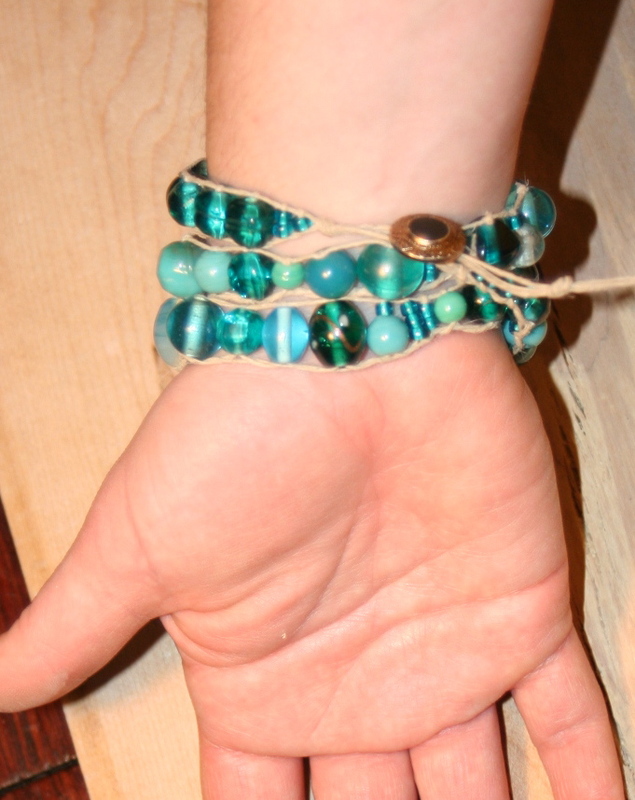 Tie off the extra on the end, and do a series of knots and spaces to allow for an adjustable/fits several sizes bracelet. Or just do one hole at the length that fits you. If you ended up too short and need an extender, it’s very simple. 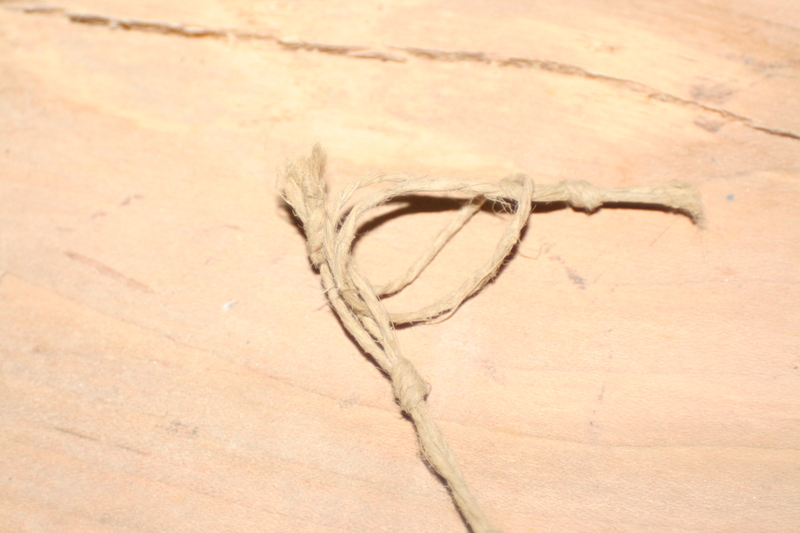 A scrap of hemp cord with an overhand knot, then thread it through the last loop you were able to tie in your bracelet. 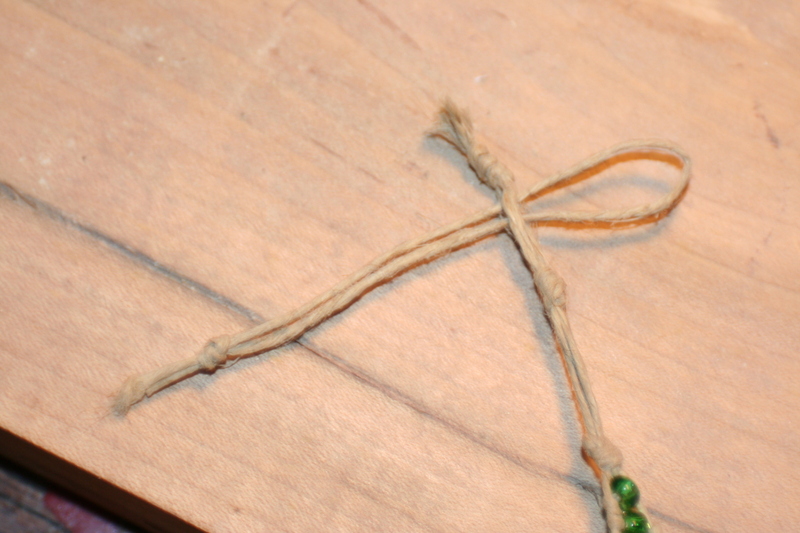 Pull the knotted tail through the loop, and it will tighten down around your last loop on the bracelet. Tie knots for spaces to make it adjustable if desired. Here’s some close-ups to compare the ladder stitch with my modified method. 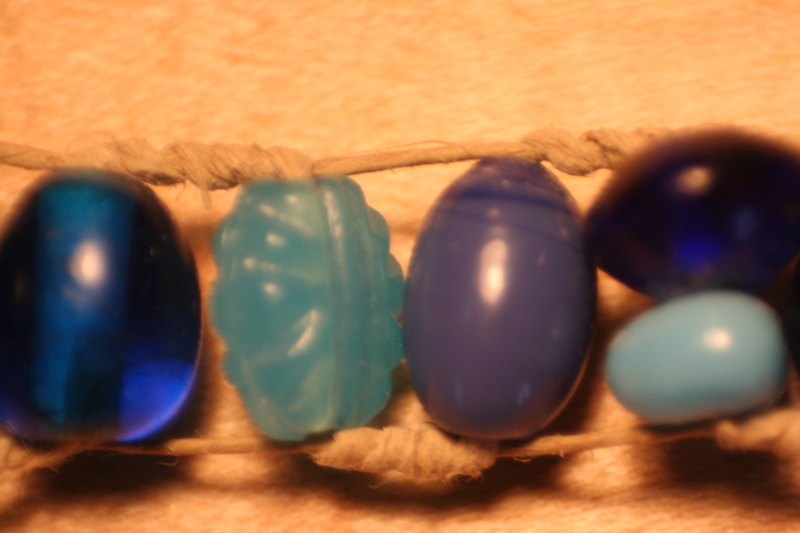 The aqua beads are done in the ladder stitch (top and bottom shown), the blue beads are done with the modified wrap (top and bottom look the same with this method). 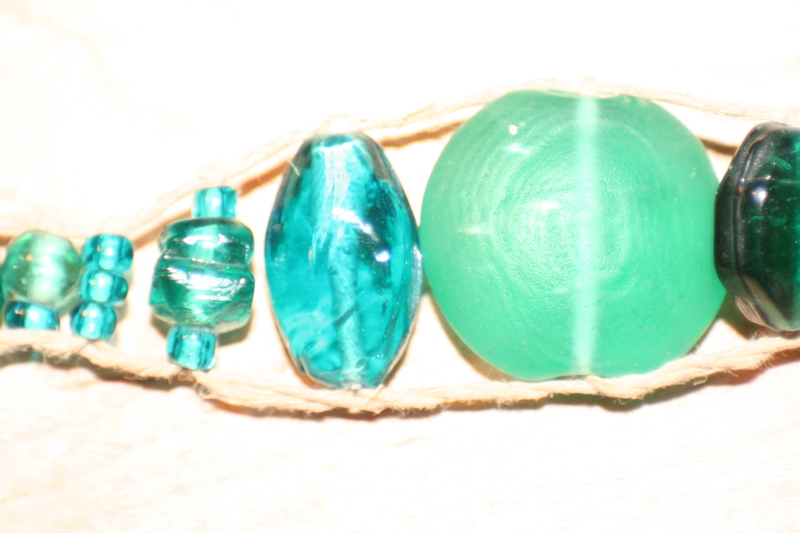 See the picture above about gradually increasing/decreasing bead size for another comparison.